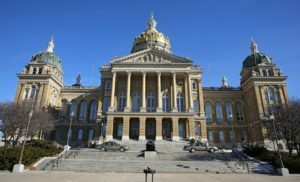 For the past several years I’ve searched for a way to get my oldest daughter to move back to Iowa, and ways to keep my younger daughter in state. Thanks to the Iowa Legislature, I’m putting those plans on hold. There’s been plenty of “progress” this session that’s contributed to my decision. A full-throated denial of local control stands out, as do limitations on workers’ rights. But the final straw came this week when lawmakers decided that if my daughters become pregnant the state can force them to continue the pregnancy and give birth. It’s a decision that sickens me to my very core, and not just theoretically. I was one of those women who learned that a very much wanted child would not survive. I had to make the choice of placing my future reproductive options and my life at risk by attempting to carry the pregnancy to term, or to end the pregnancy. I ended the pregnancy, and mourned the loss of our son. While I wish things would have been different — that he would have been healthy — I’ve never regretted the decision to terminate. After all, that choice, combined with expert follow-up medical care and months on bed rest, is the reason our family has expanded to include two more children. It was the right choice for our family, made after hours of discussion with medical professionals and loved ones. But the state of Iowa doesn’t trust my daughters enough to offer them a similar scenario. Under Iowa law, my daughters (and yours) will be forced to carry similar pregnancies to term, or give their health or life in the attempt. It doesn’t matter if the pregnancy is doomed, that the fetus has a diagnosis incompatible with life. The state has made clear that it values the potential of a child, however brief, more than it values that child’s mother. Despite evidence to the contrary — like those who loudly proclaim that women “should just keep their knees together” or “should keep their pants on” — I’ve argued against this theory. I’ve pointed to polling that has shown strong support for contraceptives, even years ago when public sentiment on abortion ran low. But even I can’t deny that members of the Iowa General Assembly are now sending women mixed messages. On one hand they are reducing access to contraceptives, and on the other they are forcing women to give birth. They are limiting access to medical care, including prenatal care, while increasing rates of unplanned pregnancies. They are reducing funding for those in poverty, while creating policies that guarantee more children will be born into poverty. So, no, I will not encourage my daughters to return or stay here, and I will hasten plans for my own escape. Thanks to the General Assembly, Iowa is no longer a safe place for women or families.